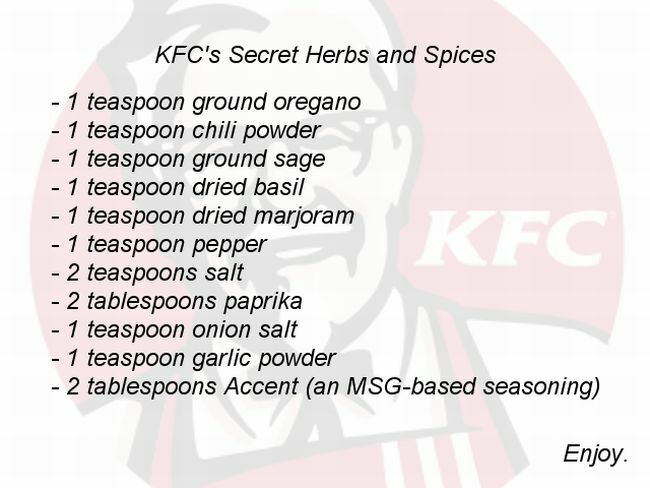 Cos KFC’s sacred formula has just been leaked. The bad news isn’t that one of the biggest secrets of fast food has exploded. It’s the banality of the ingredients themselves. Ground oregano? Onion salt? Garlic powder? Oh, and what the heck is Accent? The parenthesis says “(An MSG based seasoning).” An artificial flavor, apparently. This just be the holy grail that gives KFC the fighting edge over lesser brands. Of course, coming from a source that’s not exactly akin to Wikileaks does reduce this expose’s authenticness. Er, authenticity. It might all e a bad joke unless someone tries the instructions pictured up north and viola! It does taste like KFC. Then again, a few master chefs probably cracked the code decades ago and thought it wasn’t worth the bother and the lawsuits exposing it to the world. But if this is indeed the master formula to prepare finger lickin’ goodness, then KFC should be on the war path right now. Cutting of the source’s PayPal account, pressuring MasterCard, puppeteer the Swedish legal system…oh wait, we’ve confused this with Wikileaks. Again. Our bad.